A cross-peg atlatl or “spear thrower” recovered from Alred Shelter (Benton County) by M. R. Harrington. An atlatl is a tool used to throw a projectile. In its simplest form it is a stick with a hook at the end, but there are several variations. Atlatls allow you to throw a dart much farther and with greater force. They were a simple and effective technology used for hunting from the Paleoindian period until the invention of the bow and arrow in the Late Woodland period. The word atlatl comes from the Nahuatl language and could be a combination of words meaning “to throw” and “water,” referring to the weapon’s common use in duck hunting on Mexican lakes. Atlatl is a common term for the weapon in the archeological literature from North America, although it is also referred to as a spearthrower. The projectile it throws is commonly referred to as a dart, though some prefer to use spear, since one may be tempted to think of the much smaller dartboard darts. However, atlatl darts are typically different than spears, being lighter, flexible, and often fletched. Atlatls of the Ozark Plateau in northwestern Arkansas are represented by artifacts recovered from dry deposits under Ozark bluffs in the early 1930s. 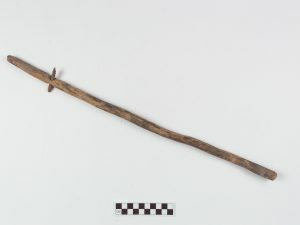 A cross-peg atlatl was recovered from Alred Shelter by M. R. Harrington, and later a fragmentary atlatl was recovered from Montgomery shelters by the team of Samuel Dellinger. It was labeled “magic wand?” by his crew in the field notes. The cross peg seen in the photo is meant to keep you from throwing the atlatl itself when you throw the dart. It keeps the atlatl from leaving your hand. In the video below you can see how this technology works. Since these tools are often made entirely of wood, they would not be visible in the archeological record except in rare circumstances like dry bluff shelters. An example of a spear point with hafting elements from Edens Bluff (Benton County). One thing we can learn about from the perishable items in the shelters is the hafting elements of stone tools such as spears, arrows, axes, and adzes. Hafting is the process used to attach stone points to spears or arrows, and the heads of axes, adzes, and hoes to their handles. These elements rarely survive in open sites, so we have to guess how they were attached. In bluff shelters some of these tools survive complete. To the left is an example of a spear point from Edens Bluff in Benton County that still has part of the hafting element attached. The base of the point would have slipped into a notch in a spear and been secured to the shaft with the binding material seen here. 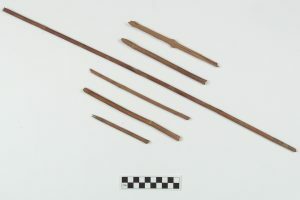 Examples of cane arrow shafts from Bushwhack Bluff Shelter (Benton County). To the right are examples of arrow shafts from Bushwack Shelter in Benton County. You can see the notch in one end of some examples where the small arrow point would fit and be secured with plant fiber or animal sinew. This arrow is decorated with red pigment. 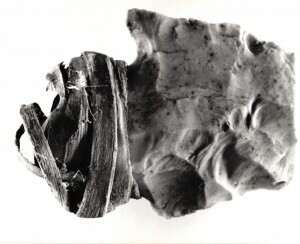 Hafted stone axe recovered by M. R. Harrington from Alred Shelter (Benton County). This is a chipped stone axe complete with handle from Alred Shelter in Benton County. It would have been used to cut wood in the same way a modern metal axe would function. Normally only the chipped stone head would survive. Hafted stone digging tool recovered by Dellinger’s crew from Beaver Pond Shelter (Crawford County). Here is an interesting example of a hafted tool from Beaver Pond Bluff in Crawford County. The handle of the tool is a slightly trimmed piece of hickory that appears to have been deliberately bent to the left and twisted to the right. A perpendicular cut mark is noticeable at the point where the bend begins, leading Dr. David Jurney, who studied the tool in the 1980s while researching siltstone tools in the Ozarks, to conclude that the handle may have been purposely bent by steaming the wood. If only the stone element had been found archeologists would assume it was part of an axe. Both use-wear and the peculiar way the stone tool was hafted point to another function—as either a hand mattock or grubbing tool. This artifact tells us much more about its role because the perishable elements survived. Deer jaw lashed to two cane splints. From the Putnam Shelter (Washington County). Finally, this object is a bit mysterious but it is not unique in the bluff shelter collections. It is the jawbone of a deer attached by strips of bark to pieces of cane. It is sometimes called a sickle which would imply it was used to harvest grassy plants. It may also have been used as a digging tool because the polish on the end of the jaw is consistent with the polish seen on stone digging tools. On an open site the only part of this artifact that might survive, given the right soil conditions, would be the bone. If it had survived, it might have been interpreted as part of the butchering of deer for food—which was probably true—but its use as a tool might not have been known.